Herbie gushed last year about Michigan. When it was a Big 10 team, he had no problem with a non-conference champ playing for the national title. I don't have a beef with no making the title game. I have an issue with ESPN playing King Maker. This, this is what is just stunning about ESPN. And why I am just furious. I can accept not getting into the title game, but we got hosed by partisan announcers. I wish I could find video of that shitbag Herbstreit going off about how "Georgia's just his assignment." What a total tool this guy is. I hope you read this, you hypocrite. You had no problem with an Ohio St./Michigan rematch last season, and you can't stand to see UGA get in the same way? Unbelievable. "Who in your mind are the top two teams right now in college football?" Well said, Herby. On that logic, based on what you were saying before LSU won the conference by a single touchdown, it's a USC/UGA national championship, right? Oh wait..
Well said, Andrew. The whole problem here is ESPN. Those folks have just gotten too big and too controlling, and I am thrilled that the SEC has their contract with CBS. Granted, CBS and Dennis Dodd are just as bad, but they are not as in your face as the "world wide leader" in sports. ESPN was once a great network, but they've sold their souls, and now we can all see it. Herby and ESPN had egg on their face from their Les Miles Mishap earlier that day, and they make up for it by lobbying for the team with two half-losses. I hope Sooner fans are just as outraged about this as UGA fans are, BTW. I will never forgive you Herbstreit. Never. Well stated guys. The blessing and curse of being on TV, especially as large a network as ESPN, is that you get a voice and the ability to wield great influence. However, that which you say can get played back to you and when you offer up contradicting logic and doublespeak, you discredit yourself and look like an idiot (plus your basic football analysis is called into question after such strong advocacy for OSU & UM and then OSU proceeds to get their pants pulled down by the Gators). As I have stated previously, we ultimately put ourselves in this jam by losing at home to SCU and getting embarrassed in Knoxville -- so, we really have ourselves to blame. That said, if we apply Herbie's '06 logic "it comes down to who the two best teams in the country are....who are the top 2 teams RIGHT now in college football? 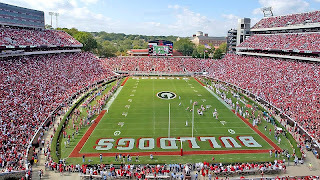 ", we would have an OU vs. UGA or USC vs. UGA or USC v. OU matchup for the BCSCG. However, what counsel did dickless offer up repeatedly over the weekend? "it is not about who are the hottest teams in the second half of the season, it is the entire body of work and winning your conference." BR, you rightly point out what was the major motivation behind Herbie and ESPNs over the top pimping of LSU. It no doubt was their attempt at doing the equivalent of a make-up call after looking like jack-offs on the Les Miles rumor. Herbstriet was on the Mike Tirico ESPN radio show that is carried up here in Chicago and it was sickening to hear them repeatedly try to explain away and cover up for the Miles debacle. Herbstreit was talking incessantly about how he was fearful of being accused of trying to deliberately distract and derail LSU by reporting the Miles rumor and how that was never his intent. So, of course when it turned out to be 100% wrong on the story, and he was revealed to look like an idiot, he and ESPN then made sure that the official ESPN position was going to be that LSU was the presumptive #2, lest they be accused of a conspiracy to derail LSU. What a freaking homer KH is...I can't believe this guy. Watching the BCS Selection show last night made me want to throw up with those jackasses sitting there rehashing the same story lines over and over. I like the nice dig Kirk had when he made it a point to say Georgia shouldn't be in the national title game, but here's the case for them being there anyway. Gee thanks KIRK, next time just spare us from the drivel that's about to spew out of your mouth. As much as I despise the likes of Tenn. and UF in particular, I hope the SEC wipes the floor with every single team out there. I would love it even more if the Big 11 didn't win a single bowl game just so the talking heads at ESPN might shut up even for one day. ESPN is doing their best MTV impression. MTV was great in the 80's when all they did was show videos. Now they have managed to alienate everyone over 25 who has a functioning brain with their programming decisions. ESPN, too, has forgotten what made them great...SHOWING HI-LITES AND REPORTING SPORTS STORIES!! PTI, Around the Horn, 1st and Ten, The Sports Reporters...these are all opinion-based shows. If you think ESPN doesn't have SOME control over what is said on these and other shows, you are sorely mistaken. But they get away with it because they have no real competition. I love the good parts about ESPN, but they are getting too powerful. I'm tired hearing about how Georgia didn't win their conference. Well...if Notre Dame was 10-2 and ranked 4th this past weekend, where does that argument go? They are an independent. If ESPN's logic that a conference winner should be in the title game, then Notre Dame should be FORCED to join a conference. Preferably, the Big Ten (11), giving them twelve teams. Then, they can split into divisions and catch up with the rest of us by having a championship game. Couldn't agree more about your ESPN sentiment. I quit watching years ago (except for my Dawgs, of course) when they decided to fill all their programing slots with screaming a$$hats going back 'n forth w/ each other. I just wish the intelligent sports fan had another option. I hope like hell these douchebags bring Gameday to Athens next year. Everyone should turn out en masse, and let Corso, and Herbstriet really know what we think of them. Corso is just an angry little man who never really accomplished much on the gridiron (playing and coaching). And Herbstreit is still pissed about getting gangbanged by Hearst, Hastings, Zeier, and Mitch Davis in the 1993 Citrus Bowl. The ESPN problem stems from the fact that we, the public, think of them as part of the media, and therefore we think that normal rules of bias and conflict of interest which serious journalists observe apply to ESPN. The problem is that they don't think of themselves as journalists, especially not Herbie. In one of the variations of his explanation of his gaffe leaking the Les-to-UM story, he said that he didn't want to break it, but his "news" people did and told him to. Way to go, Pontius Pilate. Blame someone else. His Big 10 homerism is sooooo blatant, it's nauseating. Again, in one segment I saw where he was defending this match up between OSU and LSU he said, that it was an opportunity for OSU to show they can run with the SEC. Um, Herbie, OSU is 0-8 versus the SEC in bowl games. I am sure he is going to feel vindicated if OSU wins and he can say - with a straight face, mind you - that a 1-8 OSU team vs. SEC in bowls has shown "they can play with them". And you thought it was all the Christmas goodies that made you ill come New Years Day. If Gameday were to come to Athens, a better strategy would be to just boycott it. No crowds of folks around where the cameras can make it look like we are all a bunch of teenage girls at a Beatles concert in the '60s. The only thing they should get is the noise we make in the stands (unless it's an ABC or ESPN game they wouldn't be able to show it) or the Dawgwalk. That would say something. "Really letting them know what we think of them" is just going to play into their hand and make us look silly. And that's why they have ESPN News as a separate channel. I like the boycott Gameday ideam but nless something really weird happens, I think it will be highly unlikely that ESPN will bring Gameday to Athens next year. There really are only 3 home games on our schedule that ESPN might have an interest - Alabama, Tennessee, & GA Tech. While it is possible that any of the three could be ESPN, Gameday mostly has been riding shotgun on the featured ABC Saturday night game. I guess ESPN could come if these turned out to be a matchup to two Top 5 or 10 teams. However, if that scenario happened, it makes it even more likely that CBS is going to broadcast that game. It is doubtful ESPN will broadcast Gameday from a site where they cannot even show the game. It would have to be #1 vs. #2 when no one else is even close. Odds on Tech going 11-0 before matching up with us next year? Also, Herbie and Fowler are both on the record with their disdain for Athens as a college town. They have called it overrated on radio shows. Fowler has mentioned 3 or 4 times on ESPN.com that he thinks Boulder is the ultimate college town (guess where he went to school?) and that Athens is way overrated for fun. I met Fowler at the Heisman Award dinner in 2004 and asked him about it. He said that when Gameday was in Athens he was disappointed in the experience. Plus he had heard so much about Athens and the scene. He said he did not like it - the music was overrated, the bars were not special, and the frat boys were too drunk. Of course Herbie said that we have the prettiest coeds earlier this fall - so we have that going for us. I guess Mrs. Herbie had a headache that week. It was billed as a battle of star running backs and Garrison Hearst and Robert Smith lived up to the hype. Hearst gained 163 yards on 28 carries and scored twice. Smith had 112 yards on 25 attempts and also scored twice. The difference was Bulldogs’ quarterback Eric Zeier, who completed 21-of-31 passes for 242 yards. Meanwhile, OSU quarterback Kirk Herbstreit suffered through an 8-of-24 afternoon for 110 yards. He also had an interception and a costly hand-off mix-up resulted in a lost fumble at the Georgia 16 in the fourth quarter. That mistake proved crucial. The Bulldogs promptly marched 84 yards in 11 plays and moved in front on a short TD plunge with just 4:32 remaining. Most likely GAMEDAY locals involving UGA - AT Arizona State (game will be broadcast on ABC, since they have the Pac-10, not to mention will be 2 Top 10 teams), and Vs. Florida in Jax. That could be the Top 2 teams in the country. At least we'll have enough people in Jax to have signs showing our disdain for Herbie. NOTE TO ESPN: BRING BACK TREV ALBERTS!!! Shoot, if Notre Dame even had a winning season at all, those chodes at ESPN would have put them in the national title race. It was not just Herbsteit, it was a three channel assualt to spin voter opinion once it became clear what the implication of the West Virginia and Missouri losses would mean. I flipped channels after the WVU game and Herbstreit on ABC, May and Holtz on ESPN, and Jesse Palmer on ESPN2 all recited the same talking points with no dissenting opinion. They wanted #7 to jump three teams to #2 with an ugly seven point win. That's hard to do without someone else coordinating the message. What is not clear is why they wanted LSU in the BCS game, other than perhaps to get a larger market share for ABC's Rose Bowl broadcast by bringing Illinois into the game. Tuberville was right about ESPN (Disney) having too much influence on the outcome. All that talk about who the 'best' team at the end of the year morphed into "UGA and USC are the 'hottest' teams right now." Apparently when you finish up the season playing the best football in the country you aren't necessarily the 'best' football team, but just the 'hottest'. At least that's how it's being told in 2007. I've heard 'hot team' about 5,000 more times this year than in any season before.